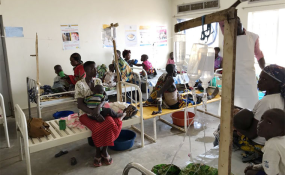 Congolese refugees receiving treatment for cholera in Hoima. Africa's refugees are on the move. They flee on foot, by car, by boat, within countries and across borders. In 2018, the continent again recorded large numbers of refugees, but the African Union (AU) has not managed to get to grips with the problem. It is the main topic at an AU summit in Addis Ababa, titled "Refugees, returnees and internally displaced persons: Towards durable solutions for forced displacement in Africa." The problem should have been on the agenda for a long time, says Erol Yayboke, deputy director of the Washington-based Center for Strategic and International Studies (CSIS). However: "The fact that the AU is addressing this issue makes me optimistic. We Americans and Europeans believe that boatloads of refugees come to us, but that's not the case. Most people stay in the region. And now it is up to the AU, because African problems must be solved by an African leadership, that is of great importance." This trend can be observed not only in the DRC. In Somalia (2.7 million IDPs) and Nigeria (2 million IDPs), the number of people displaced in the country exceeds the number of people who have fled abroad. "Of all displaced people, the number of internally displaced people is the highest," Yayboke said. "There are two reasons for this: Many of them hope to be able to return home sometime, which will sadly never happen for most of them. And the second phenomenon is that these people do not have the means to leave their country. That makes them the most vulnerable people because they have to live as internally displaced persons for long. They are the most threatened people." Many Africans are facing an uncertain future as refugees. The AU wants to help them, but so far this has not been successful, says Kathleen Newland, co-founder of the Migration Policy Institute and member of the US Board of Directors for UNHCR. "The AU should be given credit for trying, but their power is limited on what they can do. They do not have the instruments, the resources and the influence to tell countries what to do to change the situation," Newland said. The AU is an important player that has to fight against much larger powers, Yayboke says. "It does not solve existing problems completely, and then new ones show up." IDPs' biggest problem is that they are hardly protected by international law. "If I'm a refugee and I cross an international boundary, I can claim asylum. And there is a process for me as a refugee. If I'm internally displaced, the international community has less ability to support me because there are issues of sovereignty that come into play. If I'm displaced internally, I don't have a whole lot of recourse under international law," he explained. There are currently many IDPs, especially in East African countries. In the last two years, the problem seems to be spreading to West Africa: While in 2017 Mali still had comparatively few IDPs (38,000), one year later the figure had almost tripled. A similar development can be seen in Burkina Faso. This is no surprise, says Yayboke. In his opinion, this is due to the steadily growing presence of terrorist groups such as al-Qaida in the Islamic Maghreb (AQIM). Newland points out that returning refugees often become internally displaced persons as soon as they arrive back in their country of origin. For many, it is out of the question to resettle in their home town, so people move to other places. Only a small proportion of 400,000 refugees returned to their home country in 2018, something the AU wants to address. The real number is probably even smaller, says Yayboke: "People do not return to a place where there are still problems." Forced return, on the other hand, violates international law. "Someone who has been forced to leave their homeland cannot be made to return there against their will." Most Africans who see fleeing abroad as a solution are drawn to neighboring states. The country that most people are leaving is South Sudan. The youngest state in Africa is marked by civil war and famine; almost 2.3 million people have fled, mainly to Uganda, Ethiopia and Sudan. These three countries are also the top destinations for African refugees in general. Uganda topped the list in 2017 with 1.4 million refugees. By comparison, three years earlier the figure was less than one and a half million. The country is easily accessible for many refugees, Newland explains. "Uganda is very hospitable towards refugees, gives them land and encourages them to become self-sufficient." Some refugees have lived there in camps for years. New generations are born there, which naturally increases the number of refugees. But Newland believes that it is becoming increasingly difficult for Uganda to maintain this open policy. It is a long road for the African Union to tackle all these problems, Newland said. "A legal framework must be put in place to protect displaced people in Africa. I presume the AU will be working on some of the reconciliation efforts between countries like Ethiopia and Eritrea. I think there are other approaches and their intentions are good, but they're up against a huge problem which is going to take time."